It’s been a while since I last posted. About 10 months, or 312 days, or 7,488 hours… I could keep going, but I won’t. Truthfully, I am sorry. I want to apologize to the people who follow my blog and expect more regular posts from me. I want to apologize to anyone who was waiting for another photo challenge, or ATLT post. And I want to apologize to anyone who was hoping that I might reappear for my annual July Daily Blogging. But most of all, I want to apologize to myself. I graduated yesterday. It’s still technically yesterday as I type this. Last time I started a post like this, I was graduating high school, and I started off talking about how I didn’t feel any different, and how I was happy to be done and not have to spend any more time with the people in my class. This time it’s a little different. I don’t feel the same as I did before the ceremony. And I will miss seeing everyone everyday. Having just finished midterms week, I though I’d tell you why the concept of midterm exams is probably the dumbest part of college. For those of you who don’t know what midterms are, or how they work, I’ll explain. In the middle of the semester, or close to the middle of the semester, there is a week of exams; midterm exams. There’s also finals week, which is also a week of exams, but the two are very different. During midterms week, classes carry on as usual. During finals week, everything stops, and your only responsibility is to go to your exams. This is something that’s been on my mind for the past few days. The problem has always been present, but recently, I’ve seen more vocalizations on the topic. The problem I’m referencing is not more people using elevators, it’s more people judging others for using elevators. The health and fitness movement has become much more present in the last few years. That’s fantastic. People are starting to live longer, so it’s becoming increasingly important to take care of our bodies. New health problems are popping up for elderly people, and professionals are coming up with proactive ways to prevent these problems. The most important of these procedures is general activity and exercise in early adulthood. With this came the stigmatization of using the elevator. I’ve seen multiple posts on social media, and even heard a few people say things like “People that take the elevator are just lazy” and “I judge people who take the elevator without obvious injury.” I’ve heard both on campus in the past week. I’m going to address both of these comments, but I’ll start with the first one. First of all, that is not true. You don’t know why they are taking the elevator. Maybe they are tired. Maybe they worked out yesterday and they’re sore. Or maybe they just feel like taking the elevator today. Second of all, it’s none of your business. If they want to take the elevator, they don’t need to explain to everyone else why they are taking it. If you prefer the stairs, then you go ahead and take the stairs. Third, maybe take a grammar class. Comments like the second are what really annoy me. Sorry to break this to you, but not all injuries are obvious. These “injuries” are called invisible illnesses. In case you’re still confused, that means that they have some sort of illness or disorder that cannot be seen by others. Many people can’t go up the stairs, but can walk perfectly without an assistive device (a cane, for example). These people may look perfectly fine to you, but they have an invisible illness. Not that you should assume that everyone who uses the elevator has an invisible illness, take it into consideration. Actually, don’t. Don’t worry about it. It’s absolutely none of your business as to why that person is taking the elevator. When you see someone waiting for the elevator, just keep walking. Don’t even think about it. This is a problem. I know people who are afraid to take the elevator because they don’t want to be judged; they don’t want people to think they are lazy. That’s ridiculous. I know people who want to take the elevator because they are tired, but think that they can’t because they don’t have a disability. If you want to use the elevator, then do it. That’s why it’s there. If you don’t want to take the elevator, then don’t, and don’t judge people who do. While this is about elevators, I would like to make a point to say that this applies to so many things. Let other people make their own decisions. You don’t get a say unless it affects you. Focus less on what other people are doing, and worry about yourself. In procrastination, I’ve been thinking about success. Success is not something that you achieve, and keep forever. It is something that you gain and lose. Success is not an award you win and display on your shelf, its more like a state of being that you fall into and out of. Success is what you have when you feel satisfied with your actions. It could be a promotion at work, or a goal you finally reached. But neither of those things are permanent. You’ll feel happy, or satisfied with your promotion, but eventually you will want more. You’ll see yourself as successful again when you get your next promotion. Until then, you will fall into a state of contentment with your current position. Or maybe you’ll lose that job. Then what? Are you still successful? Maybe. Maybe not. It’s okay to not be successful. People also define success differently. For some it’s their job, others it’s charity work, family, money, etc. If you are truly happy, then you are successful. I refuse to buy into the idea that success is the amount of people who know your name. That’s not success, that popularity. Being famous, or infamous, is a goal for a lot of people who feel that they need to make some big impact on the world. Movie stars, musicians, politicians. These people are all famous because they do something that gets discussed in the media. But they aren’t the only successful people in the world. What about all those people who help those in developing countries. You don’t know all of their names, but does that make them unsuccessful? I don’t think so. Having tons of money doesn’t mean anything about success, either. Sure, if you have a lot of money you can buy nice things for yourself; a nice car, a big house. But what are those things if you have no one to share them with? Maybe you like being alone. That’s fine. I’m not here to judge your lifestyle. I’m just saying that there are more important things than money. Some people feel that success requires people to know your name long after you die. That’s a goal for a lot of people. We all know George Washington, Isaac Newton, and Martin Luther King Jr. We consider them to be successful. But they aren’t the only people who have been successful. What about the man or woman who spent their time and money feeding the homeless. They touched the hearts of a whole bunch of people. You don’t know their name, they probably didn’t have a luxury car or huge house, but they were still successful. The goal of being remembered forever is a ridiculous goal. Forever is a really long time. The earth won’t be around forever, just about four and a half billion more years. People will probably not even last that long. There will come a day when there is no one who remembers anything about humans. Every thing you do in your life will eventually be forgotten, so trying to be remembered is both unattainable and pointless. This may be kind of disheartening, but not if you think about what it means. You don’t have to be some huge star, just be happy with what you are doing in your life, and don’t give up just because your success is gone. Hello good readers of the world! Aside from a few photo challenges, my last post was an update in which I promised to at least try to post once a week for the semester. What. a. fail. Okay so let me explain (and by explain, I mean make excuses. Come on, it’s tradition). So last update, I explained that my computer was having problems connecting to the network at school and I had no internet. Well, I did eventually get internet, though it could have been done much quicker. As it was explained to me, the network did not recognize my antivirus software (because it was a newer version) and therefore could not allow me on the network. Apparently the fix is to make some sort of exception or something. After a week of everyone looking around and saying ‘I don’t know’, someone was able to identify and fix the problem in maybe three hours. Finally, I got internet. Well, since it took them so long to execute this quick fix, I was behind on a lot of work. I was able to do some work in the library, but a lot of it needed to be done in private (client/participant confidentiality) and I needed more than three inches of desk space to spread my papers. To sum it up, I had a huge research project that required more space than the library could provide. So my lack of internet for the first few weeks of school really set me behind on my work. But you probably stressed yourself the next few weeks to catch up so why didn’t you post after that? Let’s just say I had this crazy idea in my head that I would have time to run two campus organizations (with two positions on the executive board of each), become a senator for the Student Government Association, and take 15 credits of upper division classes. Now I know that that doesn’t really sound like all that much work but let me just explain that I had five meetings every week, each lasting at least an hour. I had events I had to plan (and also run). And I still had five classes to attend regularly, one of which required an entire social research project crammed into three months. Now it may sound like I’m making excuses. And maybe I am. Could I have posted a blog here and there throughout the semester? Sure. I could have. Would it have been a quality post that I put a lot of thought into? Probably not. As for photo challenges, well, I certainly didn’t have time to go out an take photos. But you use old photos for photo challenges all the time! Yes, but if I don’t refuel, I’ll run out. So, take this as you will. Either I was super busy and decided to use my little bit of down time to actually relax, or I don’t care about this blog and use school as an excuse not to post. Which ever boat you choose to board, do know that I apologize to anyone who missed my posts these last few months. While I am on break now, and may post a few times over the next few weeks, I feel on edge about promising posts during the spring semester. While I don’t expect my school work load to be as heavy, I can’t promise anything. As for photo challenges, I may post some here and there, but, again, I will not promise anything. I’m just here for a quick update right now. As many of you know, I have been packing and preparing for the new school year a lot recently. Well, that’s all finished, I’ve moved in and classes have started. Unfortunately, my laptop can not connect to my school’s network. This means no internet. Not only am I having withdrawal from the internet, I also can not get much of my school work done. Most importantly though, I cannot post any blog posts worth reading. Thus, I am just updating you. My computer is “being worked on” and “should be finished by Friday.” I might need to have a word with someone if it takes that long. Anyway, until this little obstacle gets taken care of, I will be unable to post photo challenges and other longer posts. I will try my best to post atleast once a week for this semester, but please be aware that unfortunately, school work must come first. I wish it didn’t, but it does. As usual, I apologize for spelling and grammatical errors. Have a fantastic day and I’ll see you when I get my computer back! Well, last week was finals, and yesterday I moved all of my stuff back home! I have a skinny pathway from my door to my bed because my room is filled with all of my things. I have made a small dent in the stacks of boxes but I got a little distracted. Anyway, you don’t really want to hear about me unpacking, do you? I didn’t think so. I just thought I’d post a little something for those of you who care enough to actually follow me! First of all, thank you for following my jibber-jabber. My blog is coming up on its two year anniversary and I’m amazed by the progress I’ve made. I’ll post something a little more sentimental on the anniversary. Anyway, I did decide, in January, to take a break from blogging during this past semester, and it turned out to be one of the best decisions I have ever made regarding this blog. This past semester has been busy, busy, busy. I had tons of work to do for classes since my brain malfunctioned and thought it would be a great idea to take an excessive amount of classes. Anyway, I’m waiting to get my grades from this past semester (they should be release sometime next week). I know I set a somewhat unrealistic goal for myself at the start of the semester by hoping I could get straight A’s again. Not that it would have been impossible, just that I would have stressed myself out way too much trying to pull it off. Simply, it wasn’t worth the stress it would have caused. On a lighter note, I also had clubs and organizations that I dedicate a small amount of time to each week. Plus, my school finally allowed a resource center for the LGBT community on campus, which I, of course, volunteered some time for. I’m not going to get into the smaller details of what I spend all my time doing, but just know that if I had tried to blog during this past semester, the content would have been spaced out and of unbelievably poor quality. I wouldn’t want to give my beautiful readers absolute crap. Wow, this post has become much longer than I originally intended. To the point! I’m back for the summer, and I will make a decision as fall approaches as to whether I will continue into the fall. For the summer months you can expect semi-regular blog posts. I have some things planned. I will be bringing back some of the old blog series that I have done in the past. 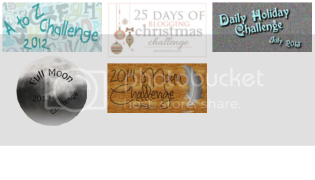 I will do a challenge in July, as has become sort of a tradition. And I will try to find some fun new ideas to keep you all entertained! Stay tuned for an obnoxiously long post coming out later today! Blood Moon, Hunter’s Moon. October 18, 2013, 7:38 pm. On the last full moon, i set a goal to blog more often. And I think this is actually the first goal that I didn’t achieve this year. I think we can allow one to slide… no? I have been super busy with school this past month. I just feel like I don’t have time for anything. Every time I do make time for fun, I get more stressed out because I have to squeeze doing homework into the day before or after my ‘fun day.’ I can’t wait for Thanksgiving break so I can de-stress. I know at this point I’m almost half way into the next moon cycle but you know what? Deal. The next full moon is still a few weeks away and my final projects for the semester are due just after it. My goal for the next moon will be to work on all of my projects and be almost done by the next full moon. 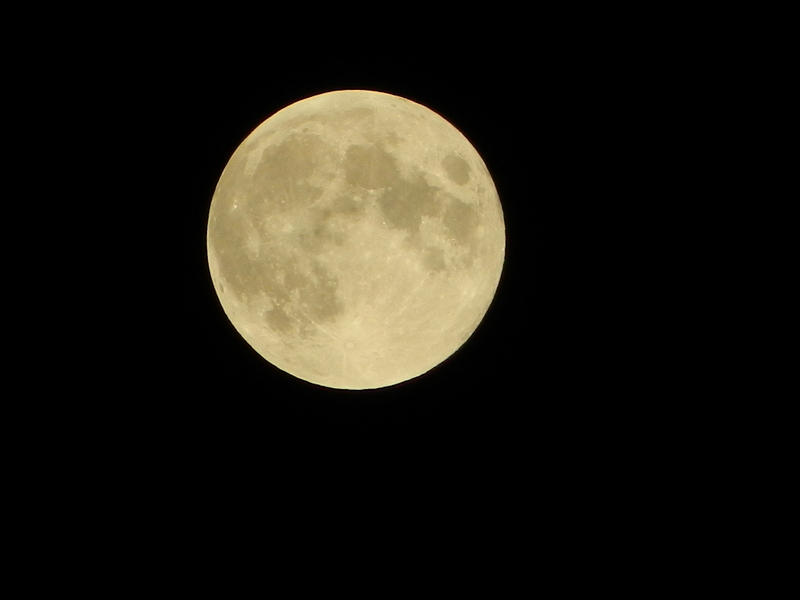 Harvest Moon. September 19, 2013. 7:13 am. On the last full moon I set a goal of starting of the school year well. I have done so! I have gotten A’s on all of my tests so far. Unfortunately, I haven’t blogged at all since the last full moon. But, grades are more important. Sorry. Since the last full moon, well, I started school! Not too much has happened yet. I got to see the moon through a telescope a little while ago. That was cool. Although I think the coolest part was being on the roof of the library. That was awesome. Anywho, not much else is going on. I will be in my dorm’s haunted house on Halloween. That’s fun. Also, All of my TV shows have come back on. The Voice, Bones, and a new series which I wan watching, Sleepy Hollow. The only problem is: they all come on Monday nights during my night class. So, Tuesday is my TV (and blogging) day. For the next full moon my goal is to blog more often. I know I have done this before but sh. I want to blog at least once a week. It will most likely be on Tuesdays because that is my free day. We’ll see how this goes!